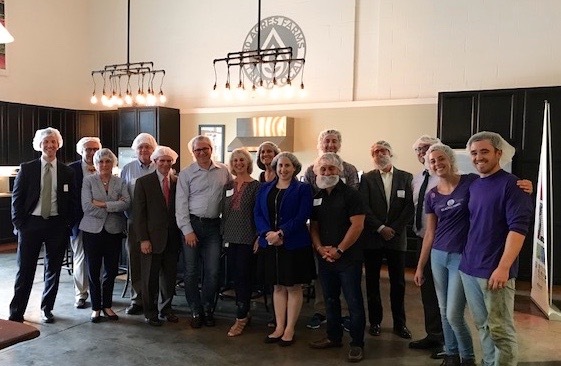 The Jewish Professional Advisors Network learns about innovation at 80 Acres hydroponic farm; their next event, an introduction to the community’s new lead professionals, is October 31. Successful innovation was the topic of the day at the most recent social event hosted by the Jewish Professional Advisor Network (JPAN). On August 3, the group met at 80 Acres, a cutting-edge urban farm, to discuss innovation in farming and philanthropy. JPAN is an affinity group of Jewish professionals in the field of law, financial planning, tax and real-estate, organized by the Jewish Federation of Cincinnati. Can farming be revolutionary? Yes, according to Michael Zelkind, CEO of 80 Acres, an indoor hydroponic farm that disrupts the current food supply chain by growing local food year-round in a sustainable and healthier way. Zelkind discussed how he transforms urban space into vertical farming and shared the innovative science behind this revolutionary idea. These urban agriculturalists are on a mission to convert city spaces into ultra-efficient, high-tech growing facilities. The ultimate goal is fresh produce for everyone and conservation of our natural resources. The Greater Cincinnati headquarters is one of five 80 Acres locations across the US, and Zelkind’s team is fundraising to expand nationally and internationally. After Zelkind spoke, the JPAN members also heard the latest on how the Jewish Federation innovates. “Innovation is an important part of Federation work,” said Deb Steinbuch, Manager, Planned Giving, Endowments, and Create Your Jewish Legacy at the Jewish Federation, citing especially the Federation-administered Jewish Innovation Funds. Now in its third year of funding “big, bold Jewish ideas,” the Jewish Innovation Funds, or giving circle, has been transforming and has supported many local new ideas that otherwise would not have existed, much less funded. “Our seven grantees have achieved amazing, diverse successes. And for our third year, we wanted to do something more: to inspire everyone to innovate at a whole new level,” said Steinbuch. As a result, the circle recently decided to fund the new Cincinnati Regional Coalition Against Hate, as well as RefugeeConnect, a group that helps refugees by connecting them through synagogues and the Urban League. Following an in-depth discussion and tour of 80 Acres, the group ended their time together at Taft Ale House for socializing and networking. JPAN’s next event will be held October 31 from 7:30-9 am for breakfast and an introduction to our new community lead professionals: Laura Baum, Head of School, Rockwern Academy; Oscar Jarnicki, President and CEO, The Jewish Home of Cincinnati (Cedar Village’s successor organization); Rachel Kaplan, Executive Director, Cincinnati Hillel; and Liz Vogel, CEO, Jewish Family Service. For more information contact Deb Steinbuch, Manager of Planned Giving and Endowments and Create Your Jewish Legacy at the Jewish Federation, at dsteinbuch@jfedcin.org.